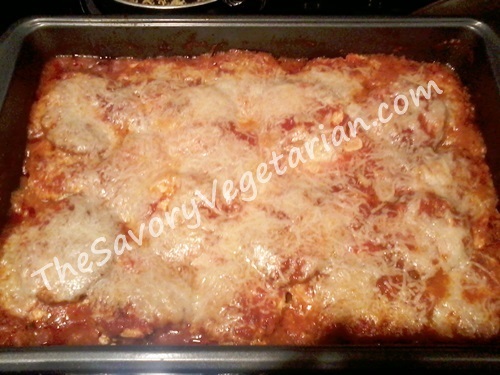 This eggplant lasagna recipe is one of our favorites. We make it all the time and it never gets old. It's super quick and easy to make so it doesn't take much prep work before you pop it into the oven, and the finished product tastes wonderful every time. Serve with a slice of garlic toast and your family will fight over the last of this recipe. It's so simple to make, we weren't sure how it was going to taste, but it is surprisingly tasty. This is the perfect recipe for anyone who has never tried eggplant before, never cooked eggplant before, or just wants a simple, delicious eggplant recipe that the whole family will love. You'll be surprised how good lasagna can be without noodles. Arrange eggplant slices in a single layer on a large cookie sheet. Bake for 10-15 minutes, until the slices are browned and slightly tender. Spray an 11x7 casserole dish with nonstick cooking spray. Spread a little sauce over the bottom of the pan. Arrange eggplant slices over the pasta sauce in a single layer. Next spread a layer of ricotta cheese over the eggplant. 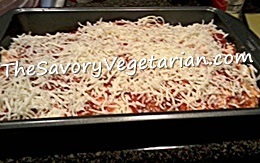 Top with 1/2 - 1/3 c mozzarella. Repeat the layering process with 1/2 cup sauce, a single layer of eggplant slices and ricotta cheese. 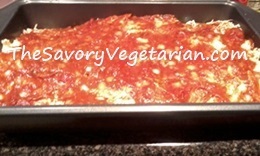 Spread the remaining sauce over the ricotta layer, then top with the last of the mozzarella cheese. 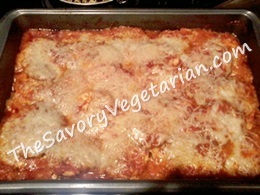 Cover and bake for about 45 minutes, until the cheese is melted and bubbling.